I think this book is firmly a three star read. We get introduced to Mr. Butler, though in the book series he has a wife. We have Phryne once again being led by her libido. At least she has good deductive reasoning though. Though I will say that whole last act was unnecessary with Phryne and I found myself bored senseless reading about her clothes and how much food she had eaten. She also makes an agreement with one of the culprits in this book that I found to be gross and offf-putting. I am still going to read the next book in the series though. “Flying Too High” is the second book in the Phryne Fisher series. I fell in love with the tv show and then decided to start reading the books afterwards. In the second book we have Phryne investigating two cases. One involving a kidnapped child and another a murder of a man who was detestable in every single way. The two cases do not relate to one another at all so you are going to have to follow two plot lines. I can honestly say I don’t care that much for book Phryne at all. She is smart, but I find her ability to sleep with anyone and not care if they are in a relationship or not, not something to be admired. Book Dot is a bit judgmental of Phryne, but loyal. I did like the parts of the book showing how Dot was so happy to have a room of her own with a door she can lock. We get reappearances of Detective-Inspector Jack Robinson who has learned to not underestimate Miss Fisher. And we also get Bert and Cec. The kidnapping case was okay, but I still feel dirty about the deal that Miss Fisher makes with one of the kidnappers. And we find out that Miss Fisher’s grand scheme was unnecessary in the end so I was annoyed about reading it. It didn’t make much sense honestly. The murder case was a bit too much to swallow for me. I did like the characters in that one, it be nice to see what happens to Amelia and her brother Bill. The writing was okay, but at times I found myself bored with the endless description of Miss Fisher’s clothes, shoes, and hats. Also I don’t really care what she eats for dinner or tea. There were long soliloquies about tea and I found myself yawning. The setting of Australia does make this series appealing to me and I do like trying to get a sense of the country from this time period (pre-WWII). The ending was a little odd though both cases are wrapped up rather neatly. 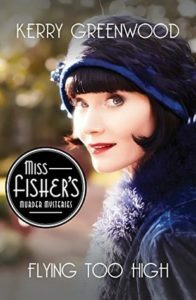 Share the post "Okay Second Book in Miss Fisher’s Murder Series"